Tomorrow night's coastal storm is continuing to push east through the Deep South, shortly due to organize and strengthen as it picks up Gulf of Mexico moisture and comes up the East Coast. It has made a wintry mark so far across Oklahoma and Texas and is going to make a soggy one on our region tomorrow night into Wednesday. By and large, this is expected to be a RAIN event for most of the event for the vast majority of the region. It may start as snow or sleet in a number of spots as dry air aloft provides an evaporative effect on the air once precipitation starts tomorrow around midday or in the early afternoon hours. 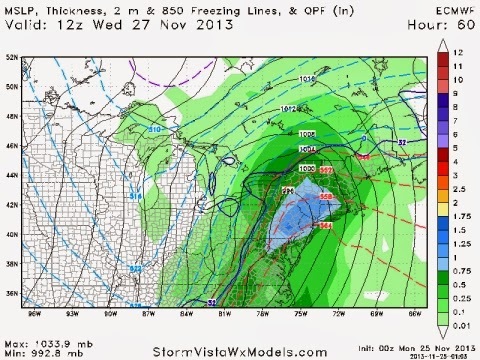 However, as milder air pushes up the coast, any frozen will transition over to rain rather quickly. At this point, odds favor areas north and west of the city getting sleet and snow on the front end before transitioning over...but the city has a shot of some sleet pellets falling for a time with light rain on Tuesday afternoon. It should not be a big deal for us locally in terms of wintry impact...any sleet pellets or snowflakes mixing in with rain should not last long. Euro, GFS, and NAM are in agreement that rainfall will be heavy across the region on Tuesday night into Wednesday AM. The best chances for the region to see frozen precipitation for more than a little bit will be in the Poconos and Central Pennsylvania mountains -- snow, sleet, and freezing rain all look likely for a time before the transition to rain takes place. 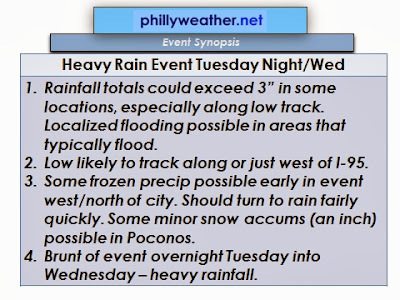 An inch or two of wintry slop could accumulate across higher elevations in the Poconos before it washes away with heavy rain (although it will be a cold November rain) on Tuesday night. Prospect for some frozen precipitation (snow, sleet, icy rain) early on, especially north and west of the city. The low is poised to track rather close to I-95 overnight Tuesday into Wednesday, pushing the coastal plain and areas east of the low track into the warm sector. There will be a pretty sharp temperature gradient from west to east as temperatures in Lancaster and Allentown could be in the 30's, while it could be 60 in Philadelphia and in the low 60's near the Shore for a time tomorrow night and early Wednesday. Low track matters more for temperature at this point for the region...some areas will warm rather dramatically tomorrow night as southerly winds ahead of the front kick in and draw milder air in for several hours. Low track will also matter a bit for the Poconos regarding how long they deal with frozen precipitation -- they likely warm above 32 during the event but a track a bit farther west with the low will help them warm over 32 a bit earlier in the storm than if the low tracks up I-95. The brunt of the event looks to be Tuesday night in the region -- and the potential for two to three inches of rain exists, generally along the low track close to I-95. Areas way from the low track should see at least an inch of rain to perhaps two inches. This would result in minor flooding for those spots that typically flood or have issues, especially since the rainfall will be a quick and dirty dump in a short period of time (an inch in three to five hours can't be ruled out). Another round of rain will track up the coast with the second "wave" along the front on Wednesday afternoon to impact the Shore and areas east and southeast of I-95. With the push of colder air in from the west occurring around the same time, some of this may fall as snow depending on how far northwest that shield of rain gets. The Poconos stand a shot of picking up some accumulating snow on the back edge of precipitation from round one and if round two gets up to them since they will cool back below freezing first. It is tough normally for the region to pick up snow on the backside of a storm system -- it does happen occasionally and modeling is hinting at the possibility. I'm not too keen on the prospect unless you are in the Poconos as dry air usually wins out over cold getting to a location in most scenarios with these storm systems more often than not. That said, it will be a rather soggy and blustery Tuesday night and early Wednesday around the region with the advancing coastal.